The security software publisher Avast has just published a report on the year 2018 with its forecasts for the year 2019. On about twenty pages, the document details Avast's analyses of both the software installed by its users and the hardware. And the company highlights a recurring problem: obsolete software. 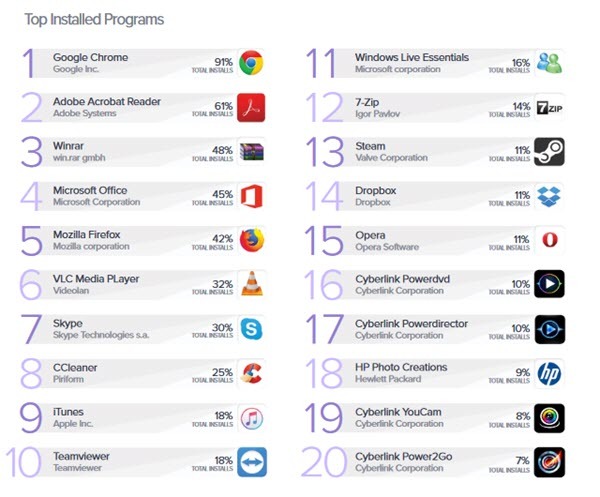 Avast starts by stating the top 5 software installed on computers: Google Chrome explodes all the scores and would be installed on 91% of the machines followed by Adobe Acrobat Reader with 61%. In 3rd, 4th and 5th position, we find WinRAR, Microsoft Office and Mozilla Firefox. 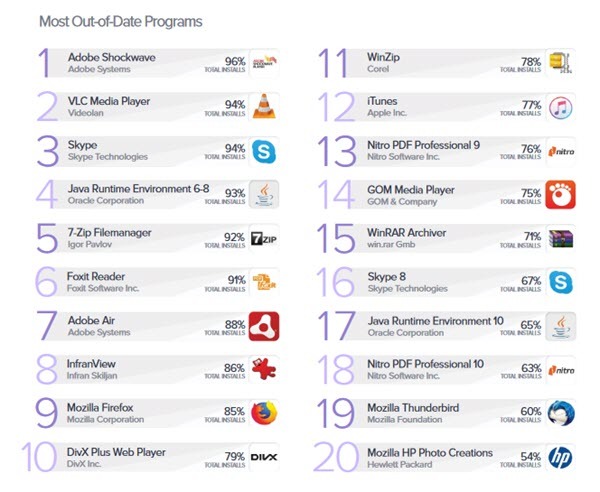 Avast then highlights one of the main problems of users: according to the publisher, 55% of the software is obsolete. Users would not be rigorous enough with the updates and it is the Adobe Shockwave program that is the first victim. Other software most affected include VLC, Skype, Foxit Reader and Adobe Air. Avast recalls the problems that can affect machines whose software is obsolete: in addition to causing incompatibility problems with the system, software that is not updated may contain security vulnerabilities that can be dangerous for user data. Avast points out software that does not always warn when a new version is available: this is the case for example with VLC or Skype. Avast also notifies users who have older versions of Office, including Office 2007 and 2010 versions. Office 2007 is no longer supported by Microsoft since 2017 and the same will happen with Office 2010 within a year. We can only recommend that you use software to automate program updates if you are not rigorous enough. Avast also offers Avast Software Updater which notifies you when a new version of your software is available.